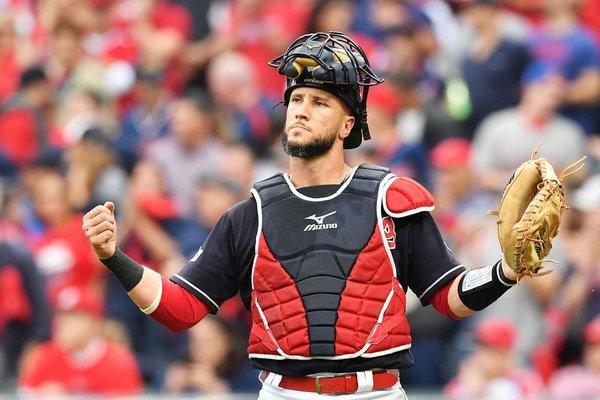 Subscribe to comments with RSS or TrackBack to 'Yan Gomes deal: I like it'. Rizzo’s going to leave the platoon split up to the idiot manager who showed no ability to intelligently use his roster last year–and Suzuki at FIRST BASE. That has to be a joke, right? I’d say this is a slight benefit to us, not a huge win. I also don’t really think gomes will contribute that much offensively, either due to injury or regression, so if I’m wrong there then the trade is better. Plus I kind of like Kieboom as a back up. This Philly trade for segura is a big improvement for them, particularly if they add a quality OF to replace Hoskins. The rumors of them going for it are real, I think. I’d put them as the most likely to go to $400m for Bryce, but even if they don’t (and for some reason, I feel like the Lerners bring him back), they could add Machado, Pollock, an SP and Kimbrel. If they do that, I’d probably say they are the favorites. On the other hand, I’m not impressed with ATL. By my count, they are down 7 WAR just by guys leaving (although admittedly, those guys provided the flukier WAR). Plus Donaldson, who I think is a risky and not-cheap bet, puts another 3WAR on the bench. So as things stand now, PHi is up and ATL is neutral to down. Long way to go, tho. alexva: great point i forgot to go back to short-A looking at depth. As for what they gave up — meh. J-Rod’s numbers as a reliever were much better than those as a starter, and some of his peripheral stats are downright ugly: 5.97 FIP, 1.54 WHIP, 15.9 BB% (ouch!). He’s supposed to have the big heater, but he only K’d 6.75 per 9 while walking 6.40 per 9. Daniel Johnson has now floundered twice in the AFL. I keep saying that he may have a higher ceiling than Stevenson, but Stevenson tore up AZ (.934 OPS). That was when he was a year younger than Johnson was this fall when he posted an embarrassing .438 OPS. So . . . I have a hard time seeing Johnson become more than a 5th OF in the majors at best, basically den Dekker. J-Rod, meanwhile, is the type the Nats usually acquire instead of dump, the big guys who look good on the mound but can’t locate their fastball worth beans. Maybe he turns into something, but the odds are that he won’t. And in the meantime, the Nats will have a catcher. The Mariners unloaded Cano’s awful contract only to pick up Santana’s. (Scratches head.) The Phils pick up a pretty decent shortstop, but not one who really supercharges their lineup. Does that take them out of the Manny derby, or just mean they’ll want Manny on 3B? Until they do something about their bullpen and the back end of their rotation, I’m not too worried. Donaldson worries me more in the middle of the Braves’ lineup than he does Wally, apparently, although it seemed a lot of bucks to spend at a position where they already had a good player in Camargo. ATL had a miraculous run with its rotation last year, and to me, it would have been a better bet for the Braves to spend big on a couple of top-of-the-line starters than it was on an oft-injured 3B. And the Nats? We’ll see. Todd, scuttlebutt seems to be that they’re not looking for a 2B, or for a reunion with Murphy (sigh). They do seem to be looking at high-end starters. I’ll think they’ll add a starter, a 1B/PH/LF Adams/Lind type, and perhaps a bullpen lefty. My concern is actually on offense, as I’m not convinced they have enough firepower when losing Bryce and Murph, particularly head to head with a Braves team that is going to score. But the offseason is far from over yet . . .
Todd, I think you’re right in the ballpark of where the Nats are under the cap, perhaps around $43M. However, scuttlebutt has been that they want to stay at least $10M under the cap number for some in-season flexibility, because of some player incentives (particularly Rosenthal), and because they always seem to screw it up when they cut it close (see 2017). So I’d say they’re only going to spend around $33M more . . . unless Uncle Ted decides that he wants nephew Bryce back . . .
I’m betting that Rizzo has told the Lerners that he’ll have to go over the cap to re-sign Harper. Everyone thinks they are serious players for Corbin, and that wouldn’t be happening if Rizzo was budgeting for Bryce. Really, the only problem I have with going over the cap is the loss of international money. The Nats have drafted so poorly that their only reliable pipeline has been the Latin one. The Cano trade is terrible. I consider Bruce + Swarzak for Cano and $20m to favor the Mariners. So Two top 100 prospects + Gerson for a good closer is not a good deal unless your team is literally 1 last piece away. The Mets are several. It doesn’t mean the Mets stink next year, but I expect them to sign a couple bets on the cheap and maybe a decent reliever. That will put them 3rd or 4th in the division and a lot has to go right for them to win. But I’ll say this for the Nats: the days of the easy win are largely over. The top 4 teams could all be .500 or better. Agreed on the division getting tougher. But the Mets are just doing it the wrong way. I think they’ve got at least a 4-win swing with their catchers right now. I think Robles could be a 3-4 win player when you factor in his defense. And I think just addition by subtraction out of the bullpen could net the team a couple wins. And that’s before you replace the replacement-level production we got from Gio with hopefully a top-of-the-line starter. 4+3+2+3 = 12 wins better so far from 82-20. Throw in just *some* of the pythag unluckiness (8 total wins in 2018) and this could be nearly a 100 win team. come on, you can feel it right? Sally, we know a lot more now! Wally, we know a lot more now! Todd, the Corbin signing is right up your alley. Waiting to hear your opinion. The good news is the Nats are probably out of the running for Harper now. I’ve been telling you guys for months that Corbin was going to get something very close to the Lester deal. I’m just somewhat surprised it’s from the Nats. I’m still processing. Short term, it’s a tremendous addition to the rotation. When I messed around with the peripheral stats of the FA starters a few weeks ago, Corbin consistently came out ahead of everyone else. If they were going to spend that much on one pitcher, though, I sure wish they had non-tendered Roark. As of now, I think they’re down to around $10M that they’ll actually spend, if they want to stay under the tax line. Hmm, that’s $6M for Sipp and $4M for Matt Adams . . .
Been busy all day, but wow. Seems super expensive when you count the picks and money, but I definitely like the pitcher. I don’t think a tender can be withdrawn. I think they’re now obligated for at least one-sixth of whatever Roark’s salary turns out to be. At the projected $9.8M, that would be $1.63M. I’ve said all along that I think there are several FA pitchers available in the $9.8M range than Roark. We’ll see. The Corbin hit might not quite as much as first thought because of deferrals. I do think the ideal Nat rotation would be to add another starter, have Roark as the 5th starter, and perhaps make Ross the long man/swing man. One point that occurs to me is that the Braves kept their “window” open for a decade and a half with four constants — three starting pitchers and a third baseman. If the Nats extend Rendon, their biggest commitments will be to three starting pitchers and a 3B. Now, all four Braves were first-ballot Hall of Famers, so it’s not quite the same, but it’s a similar model. New posted on Corbin signing! I like it.